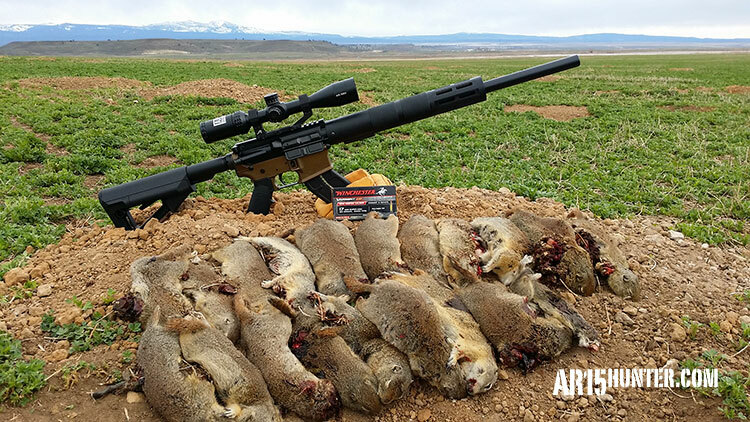 If you ask ten diehard varmint hunters what they think is the ultimate varmint rifle, you will probably get ten different answers! Everyone’s answer is subjective to what they know, the experience they have and the results they have had out in the field. It also has a lot to do with the influences on them during their varmint hunting “formative years”. 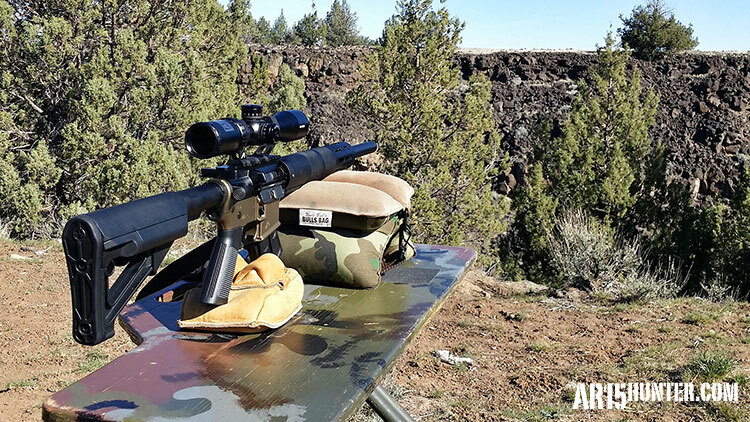 When I began looking to put together my ultimate varmint rifle, I immediately defaulted to a semi-auto rifle, in a cartridge that allowed me to pack a punch out to 250 yards, but also limit risk of ricochet, while still keeping noise levels down. I also wanted something that had ammunition sufficient for varmint hunting readily available. 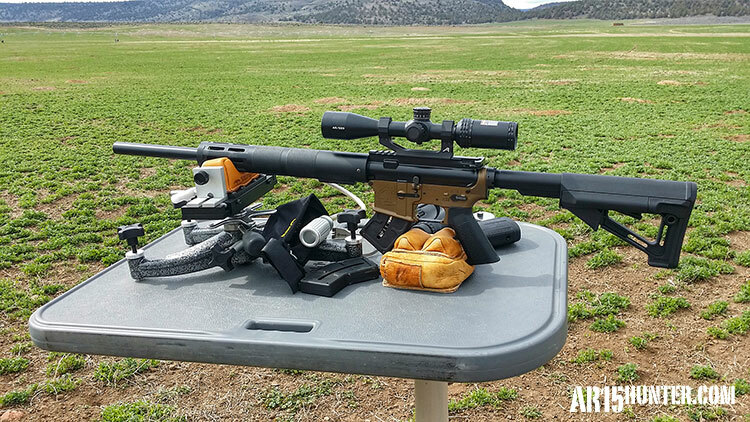 Last September, Will and I headed to Northern Arizona for some prairie dog hunting and were fortunate that we were able to test the (at the time) new Franklin Armory F17-L AR15, chambered in the .17 Winchester Magnum cartridge. The opportunity to shoot this rifle, left me with a hard decision to make. It was quite literally, the most fun I had while varmint hunting. The rifle functioned well, it was accurate, and the bonus of not having to use a “bullet-button” while I was in California, made it almost the perfect varmint rifle. There was only one problem, the F17 shoots only the .17 Winchester Super Magnum ammunition, which is a rimfire. 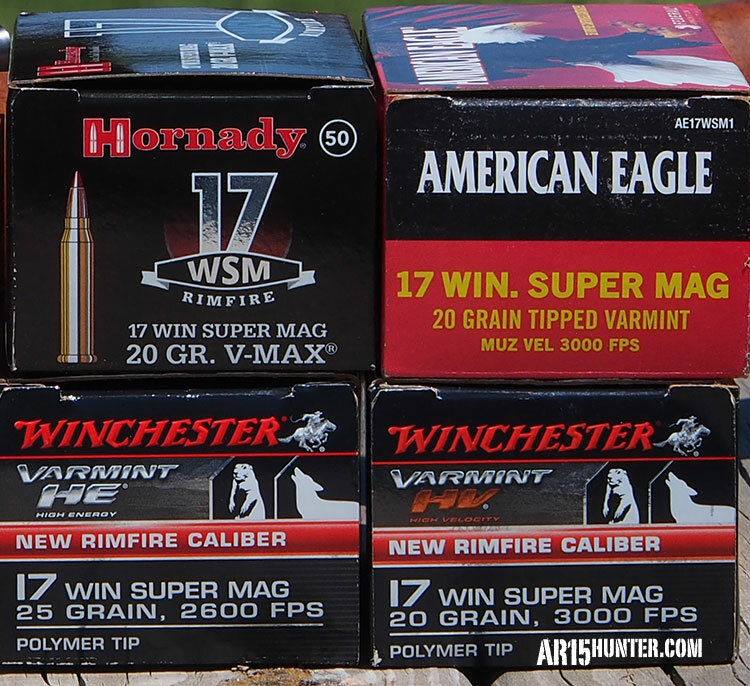 17 Winchester Super Magnum Ammunition Now Readily Available! I had recently watched Hornady and CCI stop supplying the 17HM2 (17 Mach2) ammunition to the shooting community and watched supply dry up and prices on the private market reach epic levels. I lived through this same issue when I was young, when Remington stopped producing the 5mm Remington Rimfire Magnum ammunition. I personally witnessed the price of this ammunition rise to the $80 range, per box of #50! Relief came in 2008, when Aguila/Centurion re-released the ammunition for a more down to earth price of $16 a box of #50. I was concerned about this happening again, so when AR15 Hunter headed to Las Vegas for the 2015 SHOT Show, I headed to the Winchester Ammunition booth and sought out council from one of the men who helped bring the 17WSM round to fruition. We spoke for a while on the history of the round, as well as its future. Winchester was the only producer of the ammunition, but other companies had stepped in and asked for their own branded versions. American Eagle (a subsidiary of Federal Ammunition) and Hornady had each already announced that they would have 17WSM ammunition on the market with their name on the box. Each were choosing to market the 20 grain version, which has a listed velocity of 3000 feet per second. This made sense, as the 20 grain ammunition was the most popular with varmint hunters. Adding to this information, was the fact that a couple of other companies were releasing bolt-action rifles chambered in the 17WSM. This solidified my decision, so soon after my return from SHOT, I contacted the folks at Franklin Armory and ordered one of their F-17 V4 Uppers, chambered in the .17 Winchester Super Magnum caliber. The plan was to drop the FA upper on an Aero Precision Burnt Bronze lower and make an AR15 bench gun, strictly for varmint hunting. It would need to be topped with a quality rifle scope, for reaching out to the limits of the 17WSM cartridge, and allow me to shoot most of the day without major eye fatigue. Because my first hunt trip was quickly approaching, I temporarily topped it with a Bushnell AR Optics 4.5-18x40mm scope, but changed that to a Vortex Viper HS-T 6-24x50mm scope, in a Vortex mount. There will be one, or two, more changes to the rifle, but that will be updated in a future hunt report once I make the change. Now that I had the rifle ready to go (this was before the Vortex scope), I hit the road to Northeast California, where springtime means lots of destructive varmints are coming out of hibernation, so farmers and ranchers look to varmint hunters to help keep the population down. Most people who don’t live in varmint infested areas, here in the “west”, don’t understand the sheer number of animals running around in these areas. The number one nemesis in this area is the Belding’s Ground Squirrel. This little squirrel’s population in NE California, SE Oregon, Nevada and Idaho, number in the millions and they devastate areas where farming occurs. I know many folks are asking, why don’t they poison them? Besides the extraordinary cost, alfalfa and other crops that go to feed animals that end up being consumed by humans, should not have poisoned rodents baled up with the feed at time of harvest. Besides, when they have varmint hunters who will gladly travel from all over the west to make a dent in the damaging rodent population, while feeding 1000s of raptors and other predators, why would you spend your limited resources on poison? I made the trek up north and planned to hunt the following varmints with my 17WSM AR15. Day one found me over-looking a familiar alfalfa pivot, where ground squirrel mounds dotted the landscape, as far as the eye could see (see image above). I set-up my shooting table, rifle rest and then I pulled out my FA-17 (Franklin Armory 17WSM). I settled down behind the rifle, scanning the fields in front of me and getting some readings with my rangefinder. Once I made some mental notes of distances, I pulled out my binoculars and waited for the sun to light up the ground squirrels that were going to be popping up soon. Just as I set my binoculars down, out popped a ground squirrel about 80 yards out. Even without my binoculars, I could see this guy easily. I lined up my bench, tapped the record button on my video camera and found him in my scope. 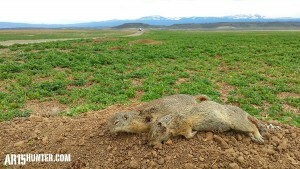 With the touch of the trigger, ground squirrel number one was laying dead out in the alfalfa field, with much of his insides, no longer inside his body! Just as I turned the video camera off, I noticed a few more brown dots out in the field, so I confirmed them as ground squirrels through my binoculars, ranged them, then shot them with my AR. More Ground Squirrel damage control with the FA-17! This was the story for the entire day, and a few to follow. Although I changed up to some of my bolt-action rifles, and even my AR15 chambered in .223, most of my shooting was done with the Franklin Armory rifle and it racked up the numbers on various varmint this trip. My hit to miss ratio was very small and my longest shots were out past the 240 yard mark. That’s not bad, considering the Belding’s Ground Squirrel is only around 9″ tall and half as wide. Rock Chuck – One of the mornings found my cameraman Tom and I scouring the rimrock surrounding a farming area for rock chucks. Although they are a favorite of the animal rights folks, they (like their Eastern cousin, the ground hog) can be very destructive. The holes they dig can cause damage to grazing cattle, horses and other livestock. They also cause direct damage to the crops they feed on. After feeding, these large rodents will head up to lay out in the sun on the lava rocks that border the area. This allows them protection from other predators, both furred and winged. We found an area that held some, but they were on the edge of a canyon where we could not get any closer than 175 yards. I set-up my shooting bench and track one as it moved quickly from rock to rock. Once it stopped, I put my 200 yard mildot on the chuck’s neck and squeezed off the shot. I watched in the scope as the bullet hit… the rock, right above the rock chuck! I quickly adjusted down and shot again, this time watching the bullet hit through the scope, causing the rock chuck to slump down on the rock, dead. After the shot, I realized that there was quite a bit of updraft coming from the canyon below, so on the next couple of shots, I did not miss. All rock chucks were dead as soon as the bullet hit. FA-17 with two large Jackrabbits taken in two shots. 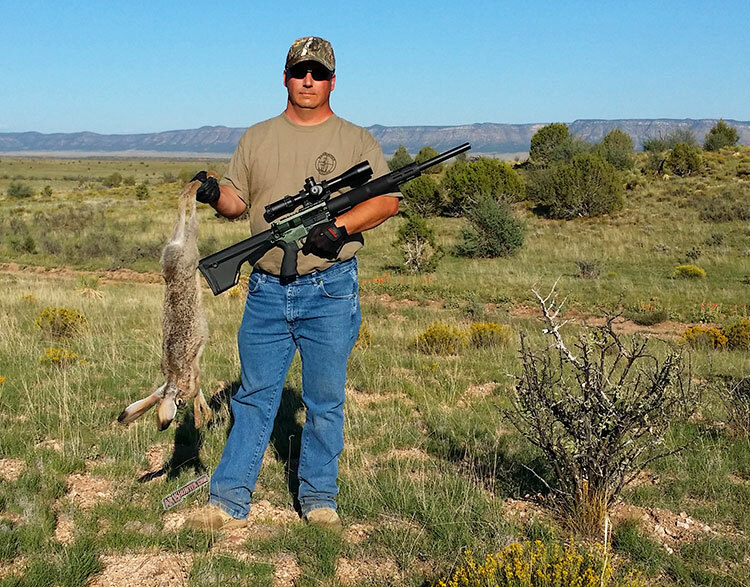 Jackrabbit – On evening number two, I decided to hunt an area that bordered some sage brush. 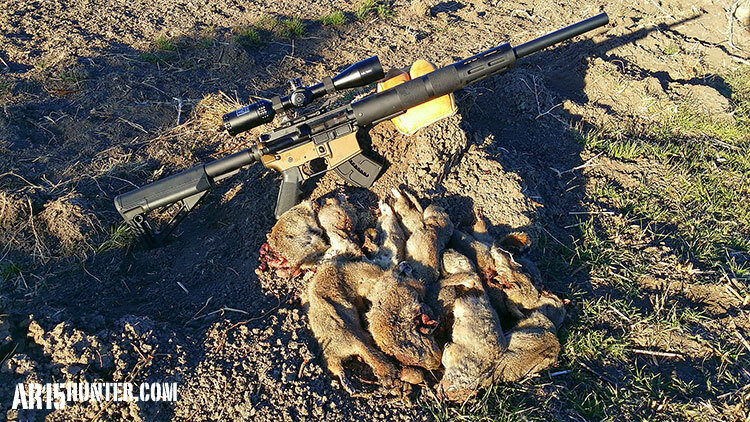 As I was spotting and shooting at ground squirrels with my airgun, I spotted a couple of jack rabbits running around about 160 yards away. I quickly went back to my truck and grabbed the FA-17. I headed back to the area where I saw the jackrabbits, but realized they were now much further out, eating along the edge of the sage. They were both busy browsing their way to the alfalfa field, so I decided to take the rear one first, then the one in the front. I put the crosshairs on the rear jackrabbit and squeezed. The bullet hit and the jackrabbit dropped in it’s tracks, without a quiver. I moved the crosshairs a few feet away and found the other jackrabbit. Right after the shot, it went straight up into the air and landed on the ground, dead. Both rabbits were taken out in a matter of seconds, with each being instantly dead. I collected my jackrabbits and headed back to my truck, very pleased with the results! Muskrat #1 taken with the FA-17. 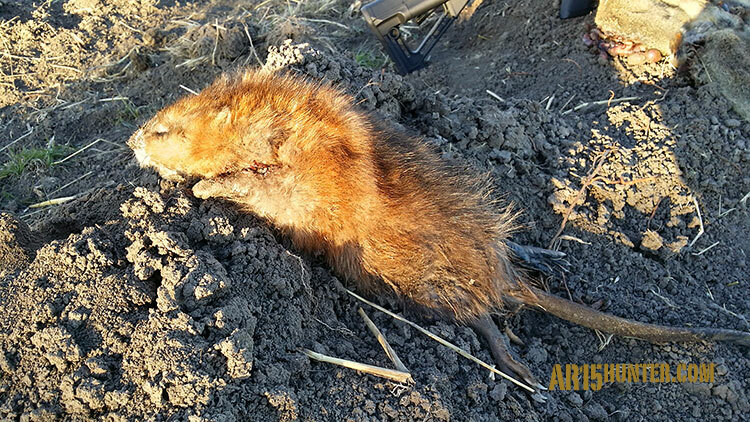 Muskrat – These varmints like to hang out in the canals that intersect the local rice fields. They are difficult to hunt due to their ability to swim underwater for long distances. I had killed one earlier in the week that showed up about 130 yards away from where I was set-up with my bench. It hopped out of the water and was feeding on the edge of the water. It was not bothered by my earlier shots, so I simply turned my bench a bit, found him in my crosshairs and shot it. We fished it out of the water a few hours later as we were taking pictures and checking out the bullet performance. It was very windy on our last day, so we packed up early to start the drive home. As we were driving, Tom spotted a muskrat sitting on the edge of a canal, down by the water’s edge. I stopped the truck and we pulled out the video camera, tripod, my FA-17 and a magazine with some ammo. We hustled back to the spot were we saw him, but there was nothing. He had disappeared into the water! As we walked back to the truck, we spotted a bubble trail coming from the middle of the canal about 60 yards away. Again, we ran up to the area to try and get a shot when he left the water, but he avoided us yet again. We played this game for about a half-hour, until we finally were able to set-up in a spot we KNEW he would pop out at. With the wind howling, I dropped down into the canal to try and get a decent rest. I took the shot while Tom filmed over my shoulder, ending the cat-and-mouse game we played with this muskrat! We fished him out of the canal and took more video. Afterwards, we dropped it at the intersection of two roads, where the local trappers asked us to drop any muskrat we happen to kill, so they could harvest the fur. In all, the FA F17 took a couple of hundred ground squirrels (confirmed kills), two large jackrabbits, two muskrat and two rock chuck in just a few days while up in Northern California. 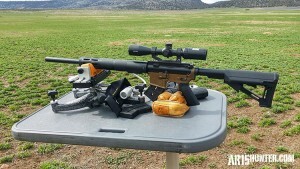 The next hunting trip for this AR15 will be to Arizona for prairie dog a couple of times this summer. The Ground Squirrel count on day one! 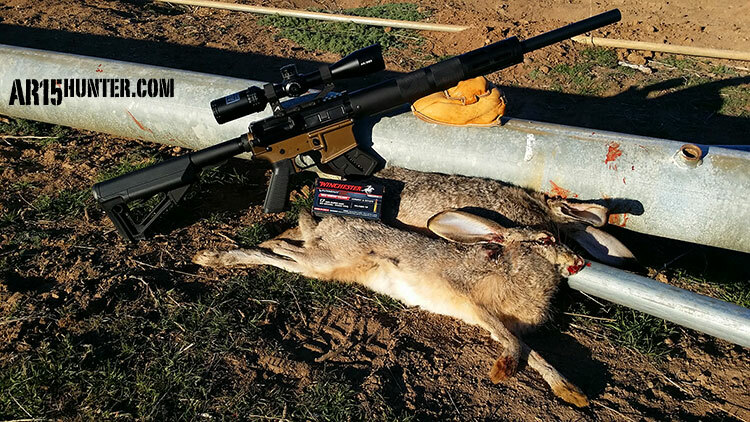 Although many folks will disagree with me on my choice of the “Ultimate Varmint Rifle”, it is hard to argue the facts that make this rifle perfect for varmint hunters. A few things I noticed while out in the field, only solidified my decision. The report of the 17WSM is no where near as loud as most of the centerfire cartridges in the same “class” (.223, 5.56, .20VT, etc). I found that when I shot the FA-17, it did not cause the other ground squirrels in the area to run for cover. 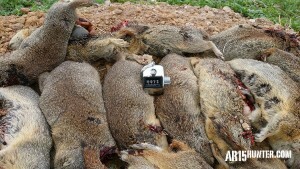 This allowed for plenty of follow-up shots on ground squirrels that were in the same vicinity as the ones I just killed. It exponentially increased my shot opportunities, which allowed for a higher kill count. The lack of recoil made for some interesting hits seen through the scope, but it also allowed me to see right where I hit if I happened to miss. That made for quick corrections for wind, or distance and increased my hits. This rifle is heavy and made for bench shooting, but it is also shooting a round that barely moves the rifle. So no guessing whether you hit your target, or not. You will know, because you just watched it! I didn’t feel beat up by the end of the day. I spent about 3 hours shooting my Remington R15 in .223 and felt more fatigued after that short amount of time, then I did after an entire day of shooting the FA-17. The small action and weight (as mentioned above) of the FA-17 means the rifle does not move much while shooting, which means very little kick against my body. 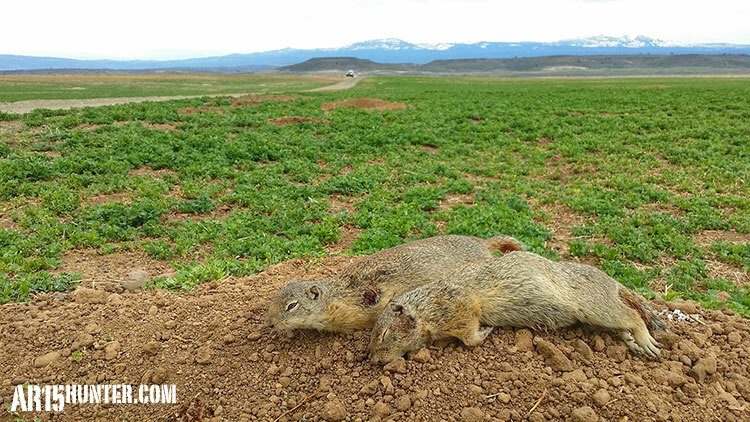 Fatigue means more than just a long night with a sore shoulder and a headache, it means more missed shots during the day, especially the prime-time of the late afternoon, when most varmints come back out to feed. I wasn’t stressing about brass. Yes, I try my best to pick-up all my brass. In fact, I use a brass catcher system on my AR15s while hunting. Even with those precautions, brass finds a way to end up getting lost. With very good brass being expensive nowadays, I don’t really want to worry about looking at my reloaded cartridge box and see empty spots. If the brass is missing, then I don’t have to get on my hands and knees to find that $1.00+ piece of custom made .20 Vartarg brass. An AR15 that is built for varmint hunting. Other than the stock trigger, which is a bit heavy, the Franklin Armory rifle is built for varmint hunting. I was able to add, or subtract, whatever I needed to make this rifle accurate and comfortable. Also, it is very accurate. 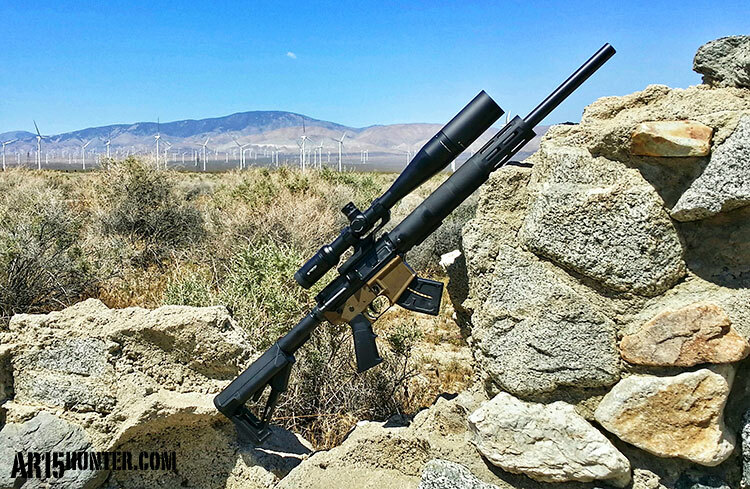 This rifle also consistently shoots sub-moa groups with the 17WSM – 20 grain bullet offering. 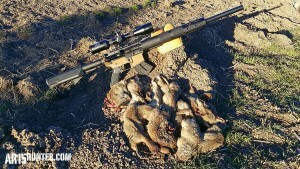 As mentioned earlier, I have two trips planned for this summer, where I will be hunting prairie dogs in Arizona. Besides that, there will be many trips in-between and after, that will allow me to put the FA-17 to work. While in Arizona, I will primarily focus on prairie dogs, jackrabbit, cottontail and predators. Once fall rolls around later this year, I will expand into predators and other small game. All the while, I will be using this rifle to prove out my belief that the ultimate varmint rifle is my Franklin Armory F17 AR15 Build. If you feel differently, watch the video above before you decide to disagree, then tell me what you think in the YouTube comment section, or on our Facebook page! Number 5 on the above list is the one thing that many who come from the old-school, bolt-action rifle, hunting community don’t understand. You can configure your AR15 to fit your needs as a hunter. With a bolt-action rifle, you can (maybe) change the stock and trigger, but you are limited by what is currently available in the after-market (which is small). AR15 rifles, on the other hand, have a huge after-market, with anything you can think of being available in the market. You don’t like the weight, length, or profile of your barrel? Change it. You want a different handguard that is more comfortable when you are wearing gloves while hunting in the winter? Change it. 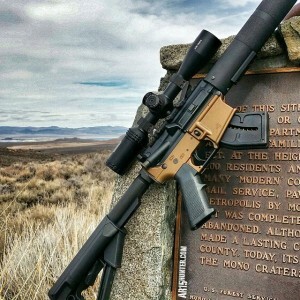 Anyone, with a little bit of knowledge, can build their AR15 back up to exactly what they want for hunting everything from small game/varmints, to big game. It is the most versatile hunting platform available today! ***The Knife Giveaway is OVER! *** We are giving away a custom Fodale Renniks Knife (see picture), along with a Fodale Knife Shirt, an AR15 Hunter Shirt and various decals. In order to qualify for the drawing, you must follow Fodale Knives on Instagram (https://instagram.com/fodaleknives or @fodaleknives ) as well as AR15 Hunter on Instagram (https://instagram.com/ar15hunter or @ar15hunter). The drawing will take place when the AR15 Hunter YouTube video on the “Ultimate Varmint Rifle – Franklin Armory F17 AR15 Build” reaches 1000 views. The custom Renniks knife supplied for this giveaway is courtesy of Fodale Knives.